Knockout specialist Reymart Gaballo and Romero “Ruthless” Duno banner another ESPN5 fight night at the Midas Hotel and Casino on Saturday. Gaballo, the World Boxing Association Interim Bantamweight champion, battles Japanese Yuya Nakamura in the featured 10-round, non-title bout, while Duno collides with India’s Kuldeep Dhanda for the vacant WBA Asia Lightweight crown. Unblemished with a 20-0 record highlighted by 17 knockouts, Gaballo will be shooting for a victory that would elevate his ranking in the bantamweight division after a first-round victory over African Julian Kisarawe in his previous fight. On the other hand, the 23-year-old Duno, who has an 18-1 card with 14 knockouts, tries to earn a place at the WBA 135-pound world rankings in the match sponsored by SMART, 1-Pacman Partylist, and Midas Hotel and Casino. “Being televised live by the help of ESPN5 is a big, big opportunity na ma-i-showcase nila ‘yung talent nila and hopefully tuluy-tuloy ‘yung pag-develop ng boxers. Hopefully, they can showcase their world-class skills to everybody in the Philippines and around the world,” said Sanman Boxing Promotions’ JC Mananquil, manager and promoter of Gaballo and Duno during the weigh in and fight press conference at Midas Tent Friday. “Reymart is still the interim the WBA world champion right now and the two WBA champions are still in the super-series events. We’re waiting the results ng tournament, but I hear rumors na baka ma-cancel ‘yung tournament, so if that happens, I know Reymart will still fight for the best,” added Manangquil, who is hopeful that a Sanman boxer will be a world titlist this year. The 5 p.m. scheduled fight night will also feature Sanman’s Dave Apolinario, who will go up against Filipino compatriot Ramshane Sarguilla in an eight-round undercard match. Gaballo, Duno, and Apolinario all met their limits after weighing 118.5, 134, and 111.5 pounds, respectively, at the pre-press conference weigh in supervised by the Games and Amusement Board. 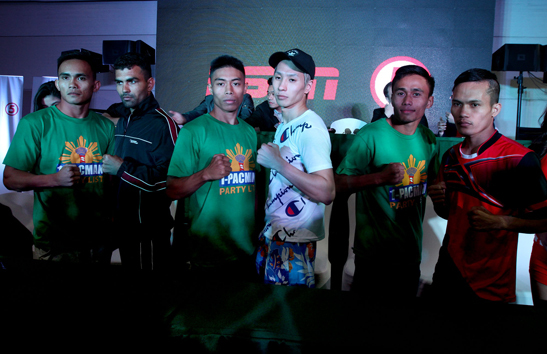 This weekend’s event is the first of a two-week set of boxing matches co-promoted by ESPN5. “After next week, we’ll announce the next wave of boxing events. It’s not just local, it’s also international. But we will have a continuous flow of boxing events that we’ll put in TV,” said ESPN5’s Lloyd Manaloto.